James Cohan Gallery Shanghai is pleased to present Matters of Faith, a group exhibition featuring works by German painter Anselm Kiefer, video pioneer Nam June Paik, American video artist Bill Viola and Shanghai-based conceptual artist Xu Zhen. Artists have always been the agents of change. In the exhibition Matters of Faith works by four prominent international artists from both the East and West make reference to the sacred and spiritual by borrowing imagery from their respective traditions and by giving material presence to the myths and metaphors of their cultures. As transformed in the framework of contemporary art, these symbols and iconography take on the role of talismans that pave the way for a world where tolerance, compassion and harmony can reign. In the paintings by German painter Anselm Kiefer, Palmostern (2006) and Domenica delle Palme (2006), the artist uses real palm fronds dipped in plaster that are collaged on to paintings created with lead and mud. The palm branch is traditional Christian iconography associated with the celebrations of Palm Sunday and Easter. The Palm is known as an immortal tree because it never actually perishes but is constantly regenerated— a new sheath of fronds buds from the side of a fallen limb. This symbol was adapted by early Christianity as a sign of Christ's victory over death and it has come to serve as a universal emblem of martyrdom. 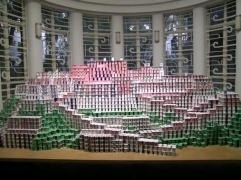 Thus Kiefer uses the symbol of Palm Sunday to reflect on the Passion and Resurrection of Jesus Christ. 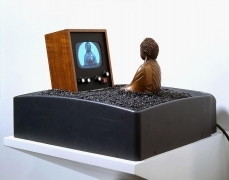 In the work of Korean video pioneer Nam June Paik, the connection between Buddhism, meditation and television is most apparent in his signature installation Enlightenment Compressed (1994), in which a bronze statue of Buddha sits to reflect upon his image on a closed–circuit television monitor. 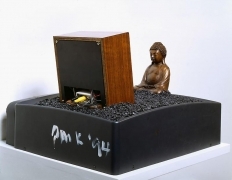 The work conflates the experience of viewing the TV with that of meditation. 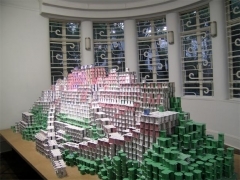 He draws a witty parallel between new electronic media and older systems of belief such as Buddhism by showing us that they both communicate in the same way. Looking into the future, Paik felt our culture could easily be consumed by technology and he uses art to urge us to question our beliefs and to view technology with a healthy dose of skepticism. Bill Viola's video work Visitation (2008) is from his recent Transfiguration series. In this work, displayed on a plasma screen mounted vertically on the wall, the black and white image of a pair of ghostly figures approach, coming into focus and eventually breaking through an invisible threshold into a world of color and light. After resting there momentarily, the figures are drawn back through to the other realm. This work brings us to the intersection between life and death and the continuum of that transformation. Also on view is Viola's Study for Emergence (2002), which is based on a work commissioned by the J. Paul Getty Museum in Los Angeles and part of Viola's The Passions series. Two women are sitting on either side of a marble cistern in a small courtyard. They wait patiently in silence, only occasionally acknowledging each other's presence. Their vigil is suddenly interrupted by a premonition as the younger woman turns abruptly and stares at the cistern, watching in disbelief as a young man's head appears. 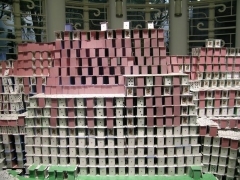 His body rises up, spilling water over the sides and out onto the base and courtyard floor. Together the two women turn to witness this miraculous event. 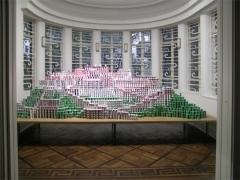 A newly commissioned work for this exhibition, Untitled (2009), by the Shanghai-based conceptual artist Xu Zhen is a parody of the Potala Palace in Lhasa (initially the winter residence of the 14th Dalai Lama and later converted into a museum and tourist attraction). 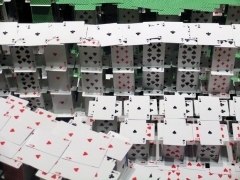 Built with more than 3,000 decks of playing cards, the sculpture becomes a sensational effort to break The Guinness Book of World Records.